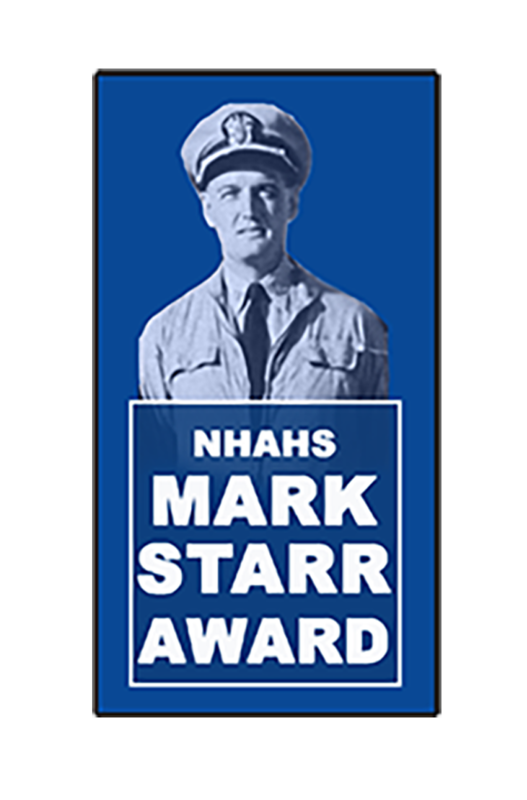 The “Mark Starr Pioneer Award” is an annual “Naval Helicopter Historical Society” (NHHS) presentation at Naval Helicopter Association (NHA) Symposium awards ceremonies. Mark Starr was the founder of the NHA. Captain Chuck Smiley, the initial Chairman of NHHS, proposed that the Pioneer award be established in honor of CAPT Mark Starr because of his many pioneering accomplishments related to aviation. One of the reasons for forming NHHS was to perpetuate Mark’s contribution to NHA. In 1978 a fire reduced the San Diego Aerospace Museum’s proud collection of aircraft and artifacts to rubble. Retired Navy Captain Mark Starr did more than restore the Museum, he decided that it would be a world class monument to the pioneers of aviation, and it did just that. He was instrumental in raising over $3 million by co-founding the Aerospace Museum Recovery Fund to rebuild the museum and the International Aerospace Hall of Fame at the Ford building in Balboa Park. Capt. Starr spearheaded efforts to select a professional designer to create the magnificent displays that characterize the rebuilt museum where the history of flight is depicted chronologically. The museum reopened in June 1980, where Capt. Starr served on the advisory board until 1985. In 1942 Mark Starr began a 34-year Navy career as a dive bomber pilot. He served in the first Navy helicopter squadron and commanded several helicopter anti submarine squadrons over the years. He also served as Commander of the Anti-Submarine Warfare Wing, US Pacific Fleet and numerous duty stations including NAF Imperial Beach and NAB Coronado. In 1952, CAPT Starr formed an exhibition team of helicopter pilots in Pensacola, Florida that performed in air shows. He taught radio / TV personality how to fly and dubbed him Celebrity Commander. CAPT Starr graduated from the University of Southern California and the Naval War College. His pioneer spirit was instrumental in founding of the Naval Helicopter Association where he became one of the early Executive Directors. Capt. Mark Starr passed away during January 1995. 2006 – CAPT Joseph M. Purtell, USN-Ret 2016 – Mr. Paul F. Whitten, Sr.